Stone is far more than a sturdy, durable construction material for hardscaping gardens and constructing outdoor living areas. It adds color, shape, texture and a distinctive look to homes, commercial properties, and public facilities. Stone adds beauty to landscapes. Along with pathways, retaining walls for raised beds and conquering slopes, dry creek bed gardens and water features, stone stars in the outdoor kitchens and living areas. These days, many homeowners are avoiding expensive interior remodels by creating backyard living space. Maybe you just want an outdoor stone fireplace or maybe you want it all. Let’s take a look at stone projects to enrich your life. Dining al fresco is easier when you have an outdoor kitchen equipped, with a prep counter, built-in grill, sink, under-counter refrigerator, drawers, and dining set. Having what you need at hand means that you won’t have to run back and forth between patio and your indoor kitchen. An outdoor living room with a stone fire pit and waterproof furnishings — including armchairs, sofas, and a rug — is a fine place for reading, relaxing after meals, holding family gatherings and just generally unwinding at the end of day. Paths can divide the yard into sectors for varying uses, such as gardens and play areas. Connected to an outdoor kitchen or living room they create an invitation to visit these different areas. They may be constructed of gravel, stone mosaics, concrete pavers, or a jigsaw puzzle of flat, fractured slabs of rock filled in-between with heat-tolerant dichondra or frog fruit plants. One unexpected destination may be a rock garden. You won’t find lots of information online about rock gardens in the Dallas-Fort Worth area, but that doesn’t mean they won’t thrive here. The key is to select small to moderate-height plants that tolerate both heat and dry conditions. Agaves, mangaves, sedums and many other succulents built for full to partial sun are good choices. So are mint family plants, such as drought-tolerant salvias and the ornamental oregano Kent Beauty. Don’t be fooled by the name of this kind of garden, which is actually a water feature when rains are heavy. A dry bed is a stream of smooth river rock between banks of garden plants. Together they form a swale to slow down, redirect, and increase absorption of rain water. Backyard water features are good places to zen at the end of the day. So are problem slopes converted to bubbling brooks tumbling past lush stands of native plants preventing erosion. At Landscape by Design, we know the right plants to turn any part of your yard into a small oasis. Another way to deal with a slope is to create a terraced series of stone retaining walls filled with colorful plants, including the vivid pinks, reds, and purples of autumn sage (Salvia greggii) — a Texas native. 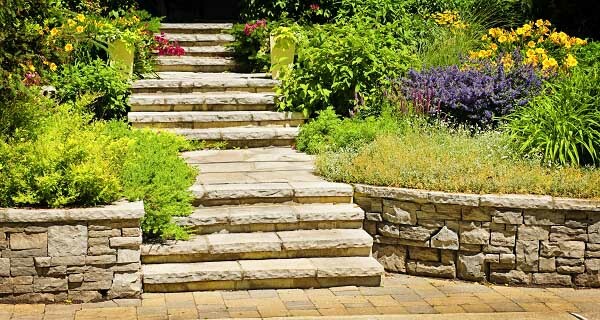 At Landscape By Design, we’re ready to help you create a landscape that rocks. Call us today at 1-817-355-1013 or contact us online to schedule a free consultation.